The redesigned and re-engineered browser is now available in beta form and features a more minimal UI and is twice as fast. Mozilla this week unveiled a preview of a redesigned, re-engineered Firefox, dubbed "Quantum," making good on its commitment to rejuvenate the browser. "We're releasing the Beta of a whole new Firefox, one that's powered by a completely reinvented, modernized engine," Nick Nguyen, who leads product development on the browser, said in a Tuesday post to a company blog. Officially designated version 57, the release has also been given the Quantum name, said Nguyen, to "convey the magnitude of the changes" in the browser. Mozilla has numbered, but never named, its Firefox releases. Firefox Quantum relies on a revamped rendering engine, in particular a new CSS (cascading style sheets) layout engine, which was, along with other components, written with Rust, a language that originated at Mozilla's research group. The result, claimed Nguyen, is a significant speed improvement, because the engine runs in parallel across multiple processor cores. "Firefox Quantum is about 2X faster than Firefox was a year ago," he said, citing the Speedometer 2.0 benchmark, and comparing Quantum to March's Firefox 52. Although Mozilla has been working on Quantum since 2013, it was only 11 months ago that the company's head of engineering pledged to ship major improvements to core parts of the browser in 2017. The plan then - and which remains in place - was to slowly replace components in the current Gecko engine with ones crafted by the "Servo" project. "Future releases of Firefox will include Quantum Render, a brand new, GPU-optimized rendering pipeline based on Servo's WebRender project, and Quantum DOM Scheduler, a new technique that ensures that tabs in the background can't slow down your active tabs," Dan Callahan, a Mozilla engineer, said in a separate post yesterday. Firefox Quantum's beta also previewed a new user interface (UI), the first major redesign since 2011's Firefox 4. The UI and user experience (UX) changes, derived from an ongoing project tapped as "Photon," also emphasize speed improvements, both real and simply perceived. Overall, Quantum's UI matches the minimalism of other browsers, notably Google's Chrome and Microsoft's Edge, by -- finally -- combining the address and search bars, and reducing the clutter at the top of the window. Chrome, which pioneered the look and then essentially set browser UI guidelines, has conquered all now that Firefox has dispensed with its old-school approach. Firefox has been on an upswing during the last year, recouping 4.6 percentage points of user share - as measured by analytics vendor Net Applications - in the last 12 months. In August, an estimated 12.3% of all online users ran Firefox. The Quantum project has been crucial to Mozilla's recovery strategy - Firefox once accounted for about a quarter of the world's user share - so it will be interesting to see whether the improvements and new UI can boost the browser further by taking share from the leading Chrome (59.4%) or the declining Internet Explorer/Edge combination (21.2%). 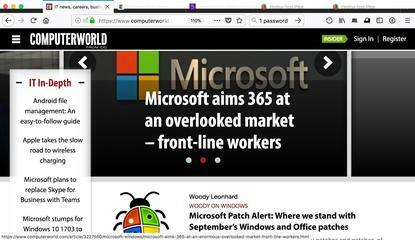 The beta of Firefox 57 can be downloaded for Windows, macOS and Linux from Mozilla's website, but it cannot be run alongside the production-grade edition familiar to most users. Firefox Quantum will be promoted from Beta to the Release channel on Nov. 14.